We often like to talk about goodwill on the corporate balance sheet, and whether the goodwill reported in a corporate merger lives up to expectations. Today we have an small example of how quickly those thoughts can change. The example comes from Tech Data Corp. ($TECD), a data services firm based in Florida. 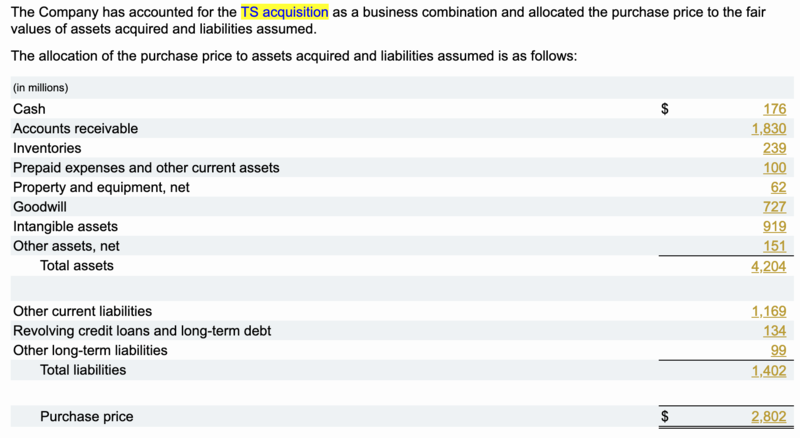 In February 2017 Tech Data acquired the assets of “TS,” the technology solutions subsidiary of Avnet, for $2.8 billion. The deal was meant to expand Tech Data’s reach globally, including into Asia-Pacific. Remember that detail. The purchase price included $727 million recorded in goodwill (roughly 26 percent of total deal price), as shown in the purchase-price allocation Tech Data elaborated, below. OK, sounds reasonable enough so far. But Tech Data took 18 months to integrate TS into its operations fully. When Tech Data finally filed its 2018 Form 10-K on March 20, we skimmed the goodwill disclosures and noticed this gem below. Emphasis added in blue. In other words, by the time Tech Data’s TS integration was fully complete, its Asia-Pacific operations were deemed not all they were once cracked up to be. So Tech Data had to trim the goodwill from this deal by 6.5 percent of the original $727 million. As we said, it’s a small example, but a telling one. (We also have much more goodwill research you can peruse on our Research page.) Calcbench subscribers can always try to anticipate goodwill impairments by poring over segment disclosures, following management discussion and statements closely — and of course, setting up email alerts on the companies you do follow, so you can start digging into the data as soon as fresh data arrives.